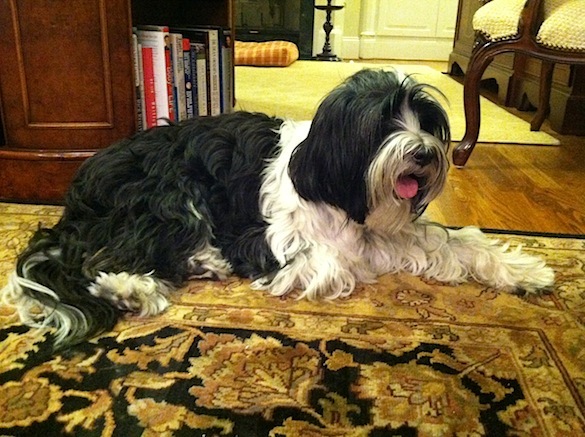 It has been almost two years since our Tibetan Terrier, Beamer, went through the trials and challenges of recovery from paralysis brought on by a rabies vaccine, Vaccinosis. Beamer recovered well but was left with permanent nerve damage that shows up as a tremor in his muscles when he stands. Beyond that, he is strong and happy. He runs, leaps, and plays. He is now almost twelve years old. Two months ago (August, 2013) we noticed a sore in Beamer’s mouth on the lower gum line. We had the sore aspirated by the veterinarian, but it was non-conclusive. We went home with instructions to keep an eye on it to see if it changed. A few weeks later, after returning from a two-week trip, we noticed that the sore was much larger. We decided to take him to University of Georgia Veterinary Hospital for evaluation. A biopsy confirmed that it was a Soft Tissue Sarcoma (Hemangiopericytoma), a cancer that is slow-growing and it did not appear to have metastasized to other organs or body parts based on further scans and tests. We went back to the UGA Vet Hospital to discuss our options with the head of the soft tissue surgical department. We were left with only two choices. Leave it alone and let it grow, which would eventually lead to death in what would probably be a six to twelve month period (and very painful for Beamer as the tumor grew into the jaw bone) or we could remove it. The decision to remove it meant that Beamer should live out his life without worrying about this tumor and cancer from the Sarcoma. However, removing it meant taking a major part of the lower jaw bone, not just tissue. 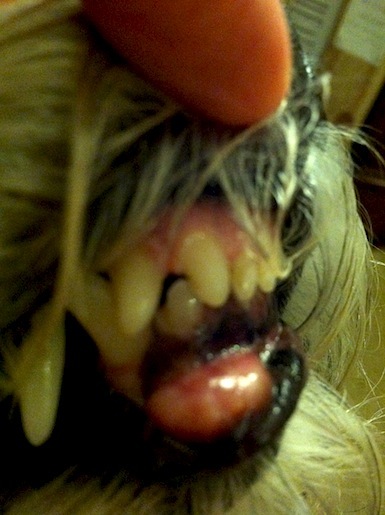 It meant that Beamer would lose his lower front teeth to the canines. This was not an easy decision. We worked with several other vets to gain their perspective and advice. It became clear that this surgery was the best decision, but we knew it was going to be very hard, on us as much as Beamer. Prior to surgery, Beamer received a CT scan to verify how deep the tumor had grown. They also x-rayed his organs. He already had an ultrasound of his abdomen to ensure there were no other growths or problems that might compromise his recovery or future health. He passed all tests and we were told that he is in really good shape for a twelve-year-old dog. It was also confirmed that the tumor was in the soft tissue and not in the bone. This was good news, but it didn’t change the need to remove the lower jaw to the canines in order to properly close the wound and assure that it wouldn’t return (clean margins). The operation and tests prior to the surgery had him sedated for about 3 hours. We didn’t get to see Beamer until the next day as they kept him quiet and medicated to keep him as comfortable as possible. We hated to leave him overnight but we knew this was best. The next day we went to visit Beamer and learned that he could go home with us that day, to our surprise and delight. But, going home doesn’t mean that he is well as we have learned. We will follow-up with another post after Beamer has been home with us for several days. Posted in Beamer, Cancer in Dogs, Coonhound Paralysis, Soft Tissue Sarcomas in Dogs, Vaccinosis and tagged Beamer, Beamer's Corner, Mandibular surgery in dogs, recovery from Coonhound Paralysis, recovery from jaw surgery in dogs, Soft Tissue Sarcoma in Dogs. Bookmark the permalink.